Things appear to be getting serious between Orlando Bloom and Condola Rashad. 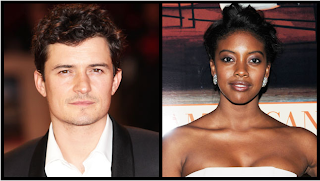 Orlando Bloom skipped the after party for his movie's premiere in order to attend his Romeo & Juliet co-star Condola Rashad's birthday celebration on Wednesday. The newly single actor, who announced his split from Australian supermodel Miranda Kerr after three years of marriage in October, attended the red carpet screening of The Hobbit: The Desolation of Smaug in New York City alone. He then rushed over to help Condola – who he has been romantically linked to - celebrate her 27th birthday at the James Hotel's club, Jimmy, with her parents, Cosby Show star Phylicia Rashad and football player Ahmad Rashad, leaving his fellow Hobbit stars to enjoy the after party without him. She.has.a.boyfriend. How many times does she have to say it? Yes, I agree, But I thing this is natural in this industry.